Every tooth is important. Some teeth may carry more weight than others. For example, the tooth in this case is the distal abutment for a three unit bridge, and the posterior left occlusion hinges on whether or not this tooth can be saved. Treatment planning these case types can be challenging for the general dentist because the reported success rates for endodontic retreatment are lower than for initial treatment. Furthermore, this tooth has a 7mm probing depth and lateral radiolucency on the mesial surface of the mesial root. Combined with this tooth being a distal abutment, this tooth is highly suspicious of having a non-restorable vertical root fracture. The pre-operative prognosis is guarded. 1. Endodontic retreatment, saving the existing bridge. 2. Extraction, without replacing the teeth, leaving no left molar occlusion. 3. Extraction, replacing occlusion with a removable partial denture. 4. Extraction, replacing with two implants, two implant crowns, and a new crown on # 20. Obviously, the best option is to save the natural tooth with endodontic retreatment, assuming we can be assured of a favorable prognosis. This option is the least invasive, most functional, and a fraction of the cost of replacement with dental implants. 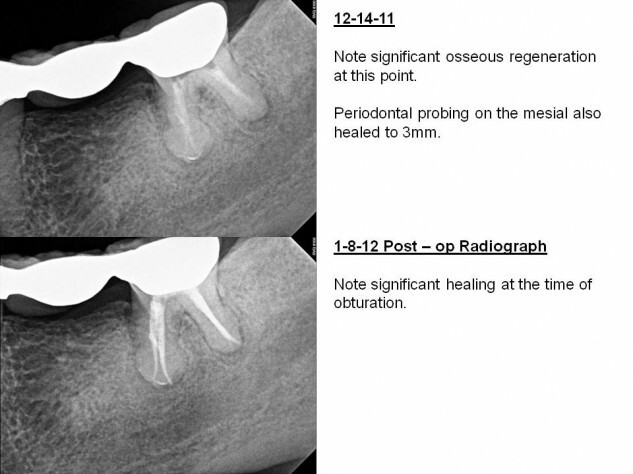 Treating teeth with a questionable prognosis in multiple visits allows us to evaluate healing prior to completing the case. Confirming that a case will heal prior to finishing takes the guesswork out of treatment planning around questionable teeth. 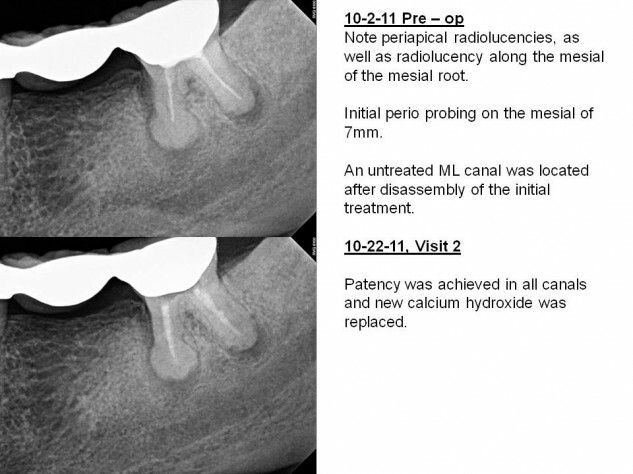 For this case, we were able to confirm success by confirming that the perio probing depth healed to 3mm, and osseous regeneration has occured. Now, treatment planning is straight forward. The tooth has been saved, so we can retain the tooth and the existing bridge. In my office, if we cannot save the tooth in question, we do not charge the patient for the treatment, thus eliminating the financial risk for the patient and referring doctor. There is no additional fee for this service.